Now that you have estimated your resources, it is time to calculate your basic educational costs, starting with exactly how much you will need to cover tuition and fees. At McGill, the cost of tuition and fees varies by program and is subject to change. Students should visit the Student Accounts website for concise and up-to-date breakdowns. Next, estimate the cost of all other school-related items, like books, lab equipment and other supplies. On average, students should expect to pay about $1000 for books for an entire academic year (8 months for Undergraduate students, 12 months for Graduate students). Bear in mind that this, and the cost of other items, varies by program. Once you have these two estimates, add them together and enter the total amount on line 12 of the Budget Pie Guidelines (Tab 1 of the Frugal Scholar Toolkit). You now have your approximate Net Resources (line 13). This is the amount that you have left over for all other expenses. On the Budget Pie Guideline, you will see that the Net Resources number has been converted into guideline amounts for everything from food to cell phone charges. 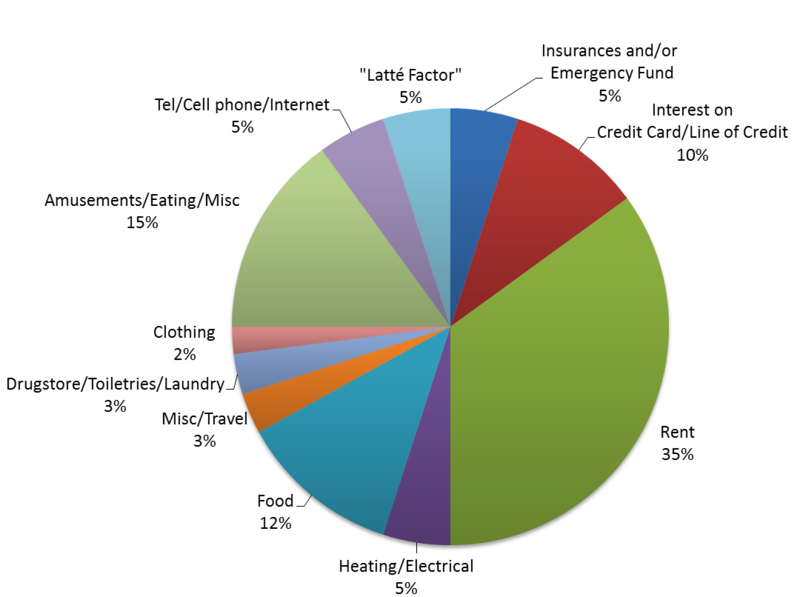 These amounts are what we suggest you spend on each living expense based on how much money you have to work with. We call this the Budget Pie because once you get your pie (ie. net resources for the month), you have to slice up the pie in a way that meets all your needs. When one slice grows (i.e. your rent increases), another slice has to shrink. If you know how much you will actually spend on any of the items listed, enter the amount to see if you are spending more or less than the recommended amount. For example, if you are planning to live on campus, enter in the cost of residence and meal plans. Or if you have found a place to live off-campus, enter in what you will be spending on rent. For information on the cost of residence, which varies significantly depending on the type, and on off-campus housing in Montreal, visit the Residences and Student Housing website. Do the estimates seem reasonable to you? Think you can live on what you have? Great! You are ready to move on to the next step - Build your budget(s). If not, you may need to revisit the Estimate your resources page to see if there are any other ways you can bring in extra cash. You can also check out Cash in on $ tips that might help you live for less!